(2B / 2L / 2D) RM480 *Select any 3 more activities. (1B / 1L / 1D) RM370 *Select any 2 more activities. *Peak Period Rates will surcharge RM20 per person. *Price listed subject to change without prior notice.Please check with our tour desk for latest updated price, if any. *Child rate is refers to children between age 4 to 10 years old. *Child rate is valid if sharing with at least 2 adult in one room. *Child who shares with 1 adult in one room will be considered as adult. - 4,343 sq km 130 million years protect area. 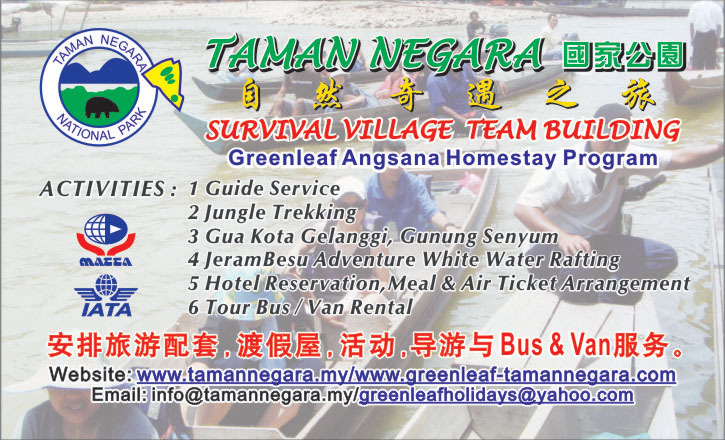 - Activities: Jungle trekking, Canopy, Orang Asli visit & Rapids Shooting. - Experience jungle walk or night cave exploration. - The stalactite and stalagmite in the caves are the world's first class and untuched. - The stalactite and stalagmite in the caves are the world's first class and untouched. - Activities: Bath with elephant , elephant feeding, video show & riding on elephant's back. - Watch the sunrise with clouds. - 3000ft height waterfall tour. - A scenic waterfall & a series of rapids hidden from public sights. - Activities: Swim & visit orang asli village. Air conditioned homely rooms complete with bathroom, water heater, hot water, TV Astro and wifi. 12:00pm Lunch at Jerantut town. 01:00pm Depart from Jerantut to Kuala Tahan, the Park’s Headquarters by own vehicles. 02:30pm Welcome to Taman Negara! Check in at accommodation. 03:00pm Boat to Aborigine Village to visit orang asli with natural habitat. 05:00pm Experience 45 minutes shooting 7 sets of the rapids to Kuala Trenggan. You must be prepared to get drenched! / Swimming at river side at nusa camp. 回程时坐船去Kuala Trenggan, 勇闯七大激流探险, 新奇刺激,Rapids Shooting河边天然浴泳. 08:30pm Video show about Taman Negara, at Interpretive Center. 09:30pm Experience night jungle walk with nature guide and visit Tahan Hide and see the nocturnal animals come alive! Bring along torch-light! 02:30pm Leave Taman Negara to Jerantut. 04:00pm Coach to Kota Gelanggi Cave. Experience cave exploration. The stalactite and stalagmite in the caves are the world’s first class and untouched. 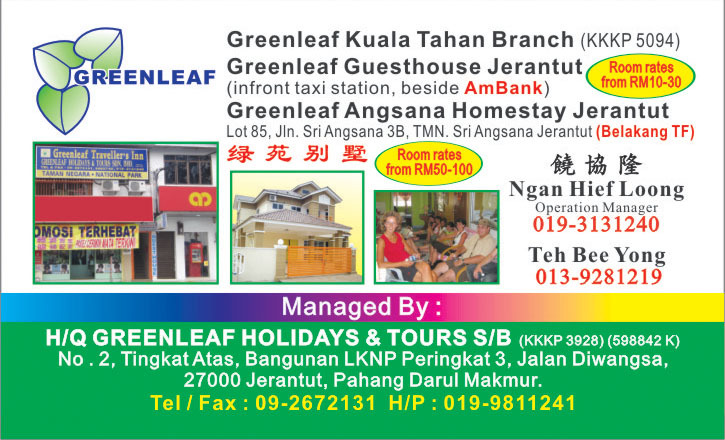 08:15pm Moving in to Greenleaf Angsana Traveller Home Jerantut. Accommodation with ASTRO tv channel, hot shower, aircond semi Bungalow Suite. 12.00pm Arrive in Kuala Gandah Elephant Sanctuary/Deerland. Jeram Besu Package, located in Raub in between Benta and Raub. It’s about 3km from Benta the nearest town. It is gaining popularity as one of the most challenging white water rafting area in the country. Established in 1993 for the national white water rafting training centre. 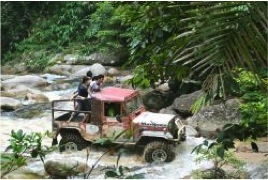 There are 7 rapid to experience and enjoy the adventure challenge. Above itinerary subjected to the weather & local condition. Please bring along T-shirt, shorts, torch light, sport shoes, slippers,drinking water, swimsuit, toiletries where applicable.